Ground floor: cafeteria, market, self-service, pizzeria, and restaurant. First floor: eating area and area for groups. 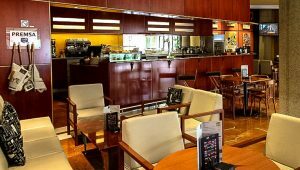 Cafeteria: cold sandwiches, sweet pastries, refreshments, coffee, tea, etc. Self-service: menu of the day, consisting of 4 starters, 3 main courses, and several desserts to choose. There is always a low calories option. Choosing half menu is also possible. 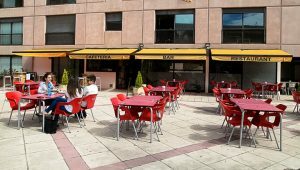 Pizzeria: Also offers a variety of salads and a complete Italian menu, as well as a take away menu. 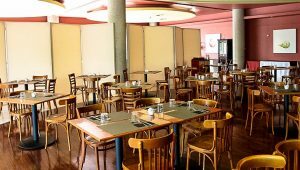 Restaurant: Mediterranean cuisine and all-you-can-eat buffet. 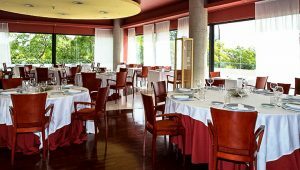 Cafeteria and restaurant. 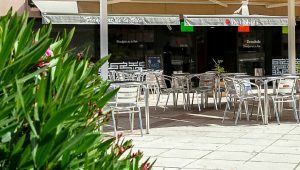 Offers sandwiches, daily menu, and “plats combinats” (set main courses). Convenient for soccer lovers: the place has 4 indoor TVs and 2 large TV screens in the terrace. Monday to Friday 13.00 – 15.30: menu of the day and take-away. Every day, 8.00 – 22.30: Sandwiches and chef’s suggestions of the day. 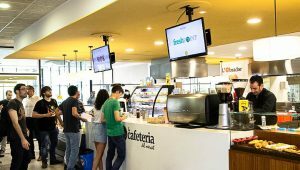 The Cafeteria closest to the CRM has a large eating area and an area for groups in its first floor with many tables and microwave ovens. The CRM has a small eating area with a couple of microwave ovens. As to where to buy ingredients for your cooking, please visit our information about living on campus.